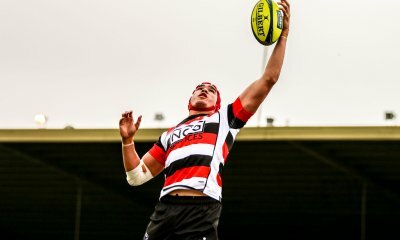 The Melbourne Rising hosted Queensland Country at Harlequins Oval in Round Two of the National Rugby Championship. Both sides lost their first round matches and would not want to drop consecutive games in such a short season. 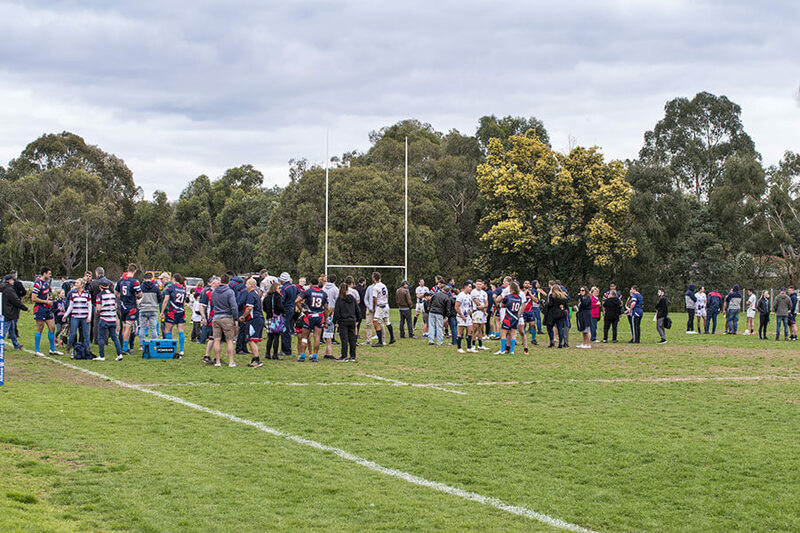 A decent sized crowd had turned up and the fans were in for a treat with a number of Wallaby squad members returning for some extra game time. James Slipper and Rob Simmons played for the visitors while the Rising were bolstered with the inclusions of Toby Smith, James Hanson and Lopeti Timani. TGI Fridays pop-up shop were serving up wings and sliders while the Tryline Bar provided real beer in actual stubbies… good times. In something of a surprise move, Ben Meehan ran out in the number ten jersey with Jack Debreczeni relegated to the bench after a poor showing last week. The game started with the Melbourne Rising hot on attack. Reward for their early efforts came quickly with Tom English coming in from his wing to score after just four and a half minutes. 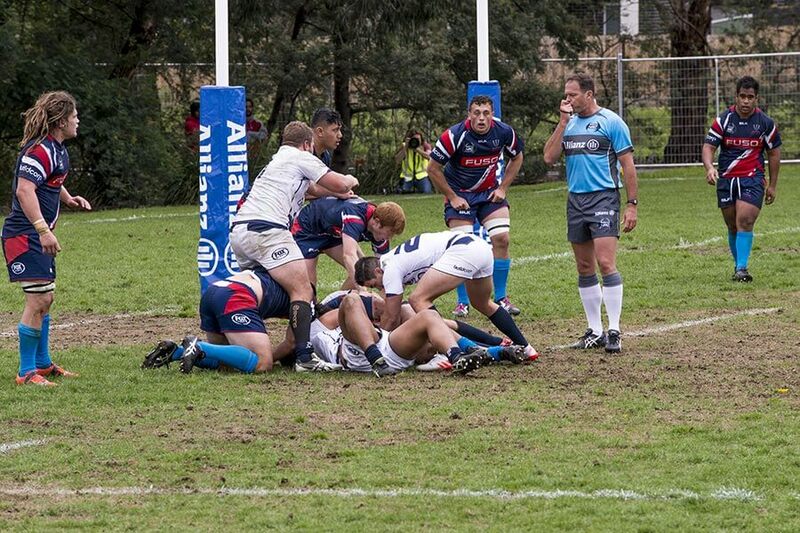 Meehan, also assuming the goal kicking duties, was accurate with the conversion – 8-0 to the Rising. A couple of minutes later Jordy Reid received a yellow card for what was deemed a deliberate knock down. Reid’s departure, and a nasty head knock that left James Hanson reeling, gave the Queenslanders a huge boost. 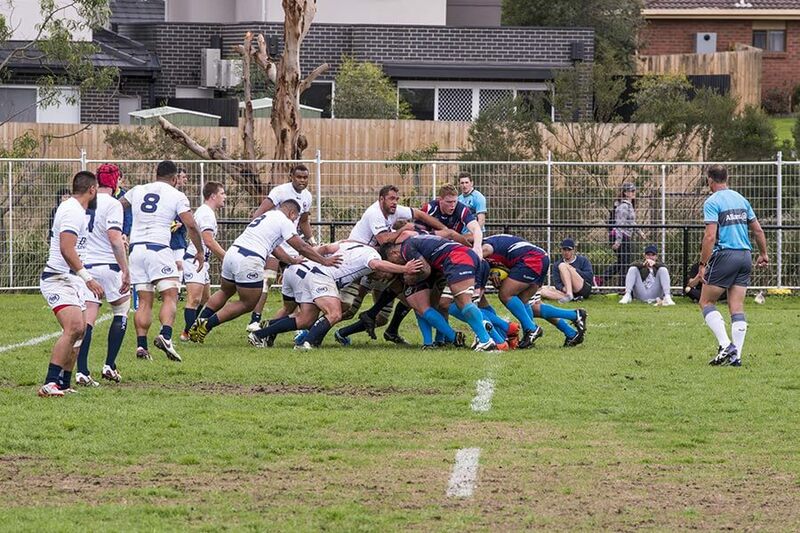 They took full advantage with three tries in just eight minutes; the first to Rob Simmons followed almost immediately by his locking partner, Izack Rodda, and the third to a hot-stepping Izaia Perese. Mack Mason kicked truly with each conversion attempt to give the visitors a 24-8 lead inside twenty minutes. Just on the half hour, the Rising earned a penalty and Meehan kicked to touch for a five metre lineout. 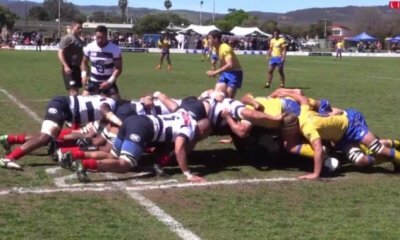 The Rising’s driving maul powered over the tryline for Pat Leafa to score. Meehan converted from the sideline to bring the Rising back in touch on the scoreboard. Queensland weren’t done yet though; following a good break in the mid-field, openside flanker, Connor Mitchell touched down near the left upright. Mason added the two points to end the half with his team leading 32-16 and looking the goods. Izaia Perese was a handful, he showed some excellent foot work and genuine speed… keep an eye on this guy in 2017. James Tuttle and Mack Mason combined well and Api Naiyabo and Izack Rodda put in solid first half performances. 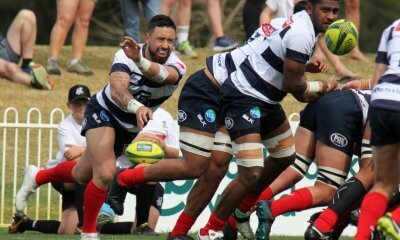 For the home team, Jordy Reid looked determined to make up for his earlier indiscretion with a couple of big hits and some strong ball carries. Likewise, Lopetti Timani had plenty of carries and tackled strongly. Ben Meehan didn’t look completely comfortable at fly-half but was doing nothing wrong. The Rising missed too many first up tackles and allowed Queensland too much front foot ball. With a sixteen point lead it looked like an upset was on the cards. He’s been doing it all day, Sir! The second half was a completely different story however. Perese was replaced early and was a big loss for Country. The Rising started to dominate territory and possession and were finding holes in the Queensland defence. After scoring three tries in a ten minute blitz to Meehan, Timani and Ah-Mau Tuimalealiifano respectively, they found themselves back in front inside the hour. The Rising were given a decent leg up through Mack Mason putting consecutive restarts out on the full which heaped the pressure back on his team. Unfortunately for Queensland, Eto Nabuli looked to sustain a serious injury attempting to stop Tuimalealiifano’s try and had to leave the ground in an Ambulance. Hopefully it’s not as serious as it looked and he’ll be back playing soon. Fifteen minutes later, Sione Tuipulotu powered his way through the Queensland defence for the Rising’s fourth try of the half. Meehan added the extras to give the home team a fourteen point lead with five minutes to play. Queensland Country had a big chance to grab a bonus point near the end of the game with a penalty five metres out and a yellow card to Alex Toolis, earned for repeated infringements. It came to nought though as the Rising won a penalty back at the next ruck and cleared the ball down field. Mr Hoffman blew “no side” with the Melbourne Rising ahead 46-32. Queensland had played very well in the first half, but went scoreless in the second, while Melbourne Rising piled on thirty points. The Rising definitely stepped up a gear from last week but still had too many handling errors and were often dis-organised in defense. 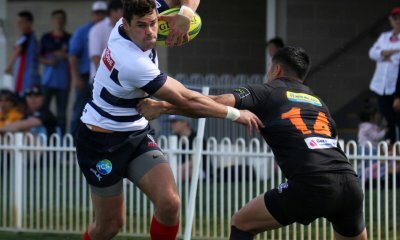 Of the Wallaby squad members, James Slipper was solid and played most of the game. He could have scored a late try if not for Hoffman blowing his whistle a bit prematurely to call back a penalty advantage. Rob Symmons gave away a couple of lineout penalties and was probably shaded by both his partner, Rodda and Sam Jefferies. James Hanson was injured in the first ten minutes, Toby Smith was solid in the set piece and Lopeti Timani had some good moments. I’m not sure what Zane Hilton put into the oranges but this game turned right around at half time. Losing Perese certainly hurt Country’s chances. Despite his yellow card, the ever-present, Jordy Reid played a big part in this win. Queensland scored three of their four tries while he was in the naughty chair. 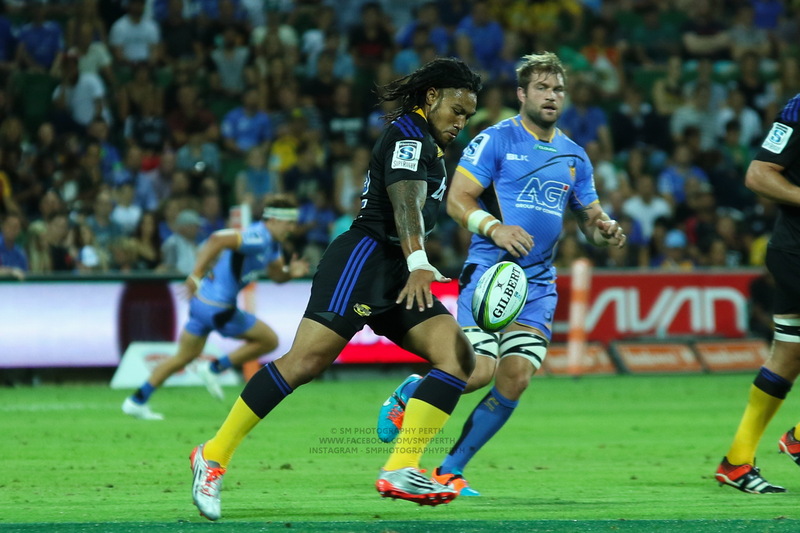 Ah-Mau Tuimalealiifano finished a nice try on the right wing and generally looked better in his second game. Api Naiyabo started the game strongly but didn’t have the same influence in the second half. Melbourne Rising: 1. Toby Smith, 2. James Hanson, 3. Tim Metcher, 4. Sam Jeffries, 5. Steve Cummins, 6. Alex Toolis, 7. Jordy Reid, 8. Lopeti Timani; 9. Nic Stirzaker, 10. * Ben Meehan, 11. Tom English, 12. Sione Tuipulotu, 13. Sefa Naivalu, 14. Ah-Mu Tuimalealiifano, 15. Jonah Placid. Replacements: 16. Pat Leafa, 17. Cruze Ah Nau, 18. Tyrel Lomax, 19. Rob Leota, 20. Harley Fox, 21. Mick Snowden, 22. * Jack Debreczeni, 23. Taiso Silafai-Leaana. Coach: Zane Hilton. Queensland Country: 1.James Slipper, 2. Alex Casey, 3. Taniela Tupou, 4. Izack Rodda, 5. Rob Simmons, 6. Apisai Naiyabo, 7. Conor Mitchell, 8. Lolo Fakaosilea; 9. James Tuttle, 10. Mack Mason, 11. Eto Nabuli, 12. Tyrone Lefau, 13. Izaia Perese, 14. Liam McNamara, 15. Tom Banks. Replacements: 16. Feleti Kaitu’u, 17. Ben Daley, 18. Sef Fa’agase, 19. Phil Potgieter, 20. Tyrell Barker, 21. Issak Fines-Leleiwasa, 22. Mitch Third, 23. Josh Birch. Coach: Toutai Kefu. Where abouts in Melbourne was it played? Harlequin oval, Ashwood. Right next to Holmesglen train Station. Sef Fa’agase can pass! Saw him with some nice to and fro passing action at one point. I was impressed by Reds’ prop Tupou. Ran like a centre and was instrumental in the first half for Country. Bit of a worry for the Rebels that Debs was on the bench his place taken by the reserve SH. We badly need an alternative FH. Not going to lie, we needed Cooper to sign with us. Was impressed with BM at FH though, had a pretty decent game and really put the pressure on JD who played well at FB when he came one. With Hodge’s boot JD really does not have any reason to have a cemented place in the side. Can TT apologize to Hegarty and ask him to come back to Melbourne. Great pics and good review! Meehan definitely had his kicking boots on yesterday, I’m hoping to see him stay in that spot next week too. Also I gave the sliders 10/10, would eat again. I like film cameras, LP records and one-handed backhands... and rugby. I hope rugby doesn't go the way of film cameras, LP records and one-handed backhands.